On the 23rd June 1939 in Berlin, Fascist Italy and Nazi Germany signed an agreement that fixed the absolute relocation of South Tyroleans in territories in Eastern Europe that had yet to be conquered. The South Tyroleans were given just half a year to decide for or against the resettlement. This decision process drove a large wedge between the South Tyrolean people – often it tore entire families apart, with each person fighting for what seemed the best for themselves at that time. Scars from this period of discord were to be felt by the South Tyrolean population for years to come. The National Socialists launched a huge propaganda campaign to encourage the South Tyrolean population to “opt” for resettlement. Lies were deliberately spread amongst the people to incite hatred against one another. Soon a crack ran through the entire South Tyrolean population – the divide between those willing to resettle and those wishing to stay in their homeland was irreconcilable for a long time. The majority of South Tyroleans decided on resettlement. Ultimately 75,000 emigrated abroad. Source: Sammlung Steurer, Meran in: Rolf Steininger, Südtirol im 20. Jahrhundert, Innsbruck, 1997. Around 80% of South Tyroleans decided to leave their homeland in 1939. Some of them left South Tyrol within a year and mostly ended up in North Tyrol. Which activity was photographed here? What possessions do you see? Imagine being a good friend of this family and writing an entry in your diary about it so that it will never be forgotten. Display teacher's view to find the answers. The “option”for the South Tyroleans – an agreement between Mussolini and Hitler for the resettlement of German-speaking South Tyroleans – was a political act which we would today call ethnic cleansing. In June 1939, both dictators agreed that South Tyroleans should be expelled from their homeland - where their ancestors had been living for centuries – because they did not fit into the fascist idea of a closed Italian nation (Hitler-Mussolini Option Agreement). “Heim ins Reich” (Home into the Empire) was the slogan of the Nazis, who used it in 1938 to occupy Austria and parts of Bohemia. However, as Hitler did not want to offend his ally Mussolini, he waived the annexation of South Tyrol. 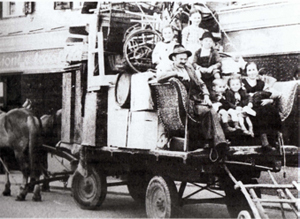 To leave South Tyrol in Italian hands but transfer the people was the order of the day in 1939. The Nazis began a huge propaganda campaign to persuade the South Tyrolean population to opt for resettlement. The people had six months to decide for or against leaving their homeland. The German Reich did not have enough money to make the basic payments for resettlement land. They could not find an area big enough for all the resettlers. In total, 75,000 people were resettled, and the majority of these settled in North Tyrol. The fall of Mussolini and the Wehrmacht‘s subsequent occupation of Italy brought the resettlement process to a complete halt in 1944. 5-part documentary film about the South Tyrol Option Agreement by Andreas Gradl – the 4th part seems tob e the most suitable for the work on this topic. Link: You tube – Südtirol- Die Option. Film by Karin Brandauer and Felix Mitterer: Verkaufte Heimat. Family man – appears older. Mother, six children, one being an infant. The father looks somewhat shy, all the others look into the camera in a friendly manner. Sofa, disjointed furniture, wine barrel (hopefully full! ), spinning wheel, bicycle, boxes with household goods. They are departing. The cart is in front of a shop which has an Italian sign on it.